Almost every home has a vacuum cleaner, but what about a carpet cleaner? Even if you vacuum your home on a consistent basis, plenty of dirt, dander, allergens, and debris can remain in your carpet and rugs after vacuuming, affecting the look of your home, and even the smell and air quality. They are just as essential as a vacuum if you want to keep your carpets and rugs looking their best, while also maintaining a fresh smell and allergy-free environment inside. Just a few decades ago, cleaning your carpets involved calling a professional, or renting a machine. Today, you can own one for a fraction of the price. Below are our top 10 picks for the best carpet cleaners on the market. While only a few select brands manufacture these machines, you’ll find a wide variety of sizes, prices, and capabilities represented in our list, which ranges from full-sized units, to smaller handheld versions. If you are looking for professional cleaning service quality packaged into a home product, the Bissell Big Green Professional Deep Cleaning Machine should be your first choice. This cleaner packs an astounding amount of power and capability into a reasonably-sized unit, giving you everything needed to ensure carpets that look and feel like they were serviced by the professionals themselves. 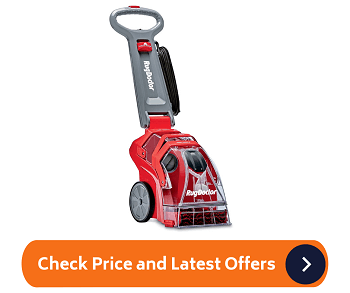 At the heart of this unit’s cleaning power is the extra-large PowerBrush that thoroughly scrubs your carpet with each pass, while a robust motor creates a high amount of suction to lift and remove any dirt, sediment, and stains. With just one pass, you’ll immediately notice a huge difference, even if your carpets are already in decent shape. One primary advantage of this unit is its ability to clean on forward and backwards passes. This means the Big Green Deep Cleaning Machine is always cleaning, regardless of what direction you’re pushing or pulling. This cuts your clean time in half, and ensures a deeper clean throughout. The Big Green Cleaning Machine uses a large dual tank system that separates the dirty water from the clean water, and allows for fast & easy emptying. It also includes a 6-inch wide stain tool attachment that lets you clean tough spots on upholstery, stairs, and furniture, with plenty of reach thanks to a 9-foot hose. 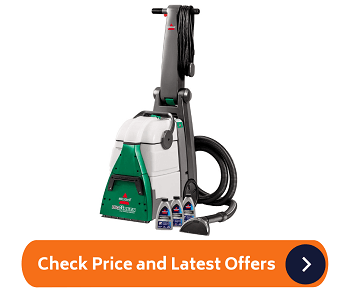 Although the Bissell Big Green Deep Cleaning Machine is not cheap in price, the high cost is certainly warranted, and will eventually be made up for when you account for the professional cleaning costs you can avoid in the future. Furthermore, a full 5-year warranty guarantees you’ll get your money’s worth. Pet owners know that having pets in the house creates its own special set of needs that can make carpet cleaning a bit too complicated for ordinary ones. The Bissell Deep Clean Deluxe is our 2nd best vacuum cleaner for carpet which specifically made for pet stains and messes, while also serving as a traditional cleaners as well. The Bissell Deep Clean Deluxe is full of special features that address every aspect of pet stains. The primary cleaning action is provided by a combination of dual DirtLifter PowerBrushes that make several passes into your carpet in order to loosen and remove dirt, while the unit’s robust motor generates powerful suction that lifts dirt and stains away and into the tank. HeatWave technology keeps the water temperature consistent throughout the cleaning process. Now for the array of pet features. The Bissell Deep Clean Deluxe has a pet hair collection basket that catches loose hair within the carpet, and keeps it contained so it doesn’t make its way into the tank. An expandable tough stain tool can loosen and remove tough, embedded stains, while a separate stain trapper tool can scrub and remove unpleasant stains and mess — and then contain it all within its own mini tank. The Bissell Deep Clean Deluxe even has a CleanShot pretrater that literally shoots cleaning solution from a nozzle in the front, directly onto a tough stain, giving it some added attention while you’re making passes with the main unit. The Bissell Deep Clean Deluxe is the ultimae for pet owners, and does everything possible in order to make carpet cleaning and stain removal as easy and effective as can be. Hoover’s Power Scrub Deluxe Carpet Washer is a versatile and formidable machine that is suited for average home use, and provides a number of smart features that make cleaning much more efficient, fast, and effective. Everything starts with how the Power Scrub Deluxe does its cleaning. Rather than using the standard overhead spinning brushes mounted horizontally, the Power Scrub Deluxe uses a set of round brushes that sit flat and rotate 360 degrees. This is much more gentle on your carpet, while still being effective at lifting and removing stains. 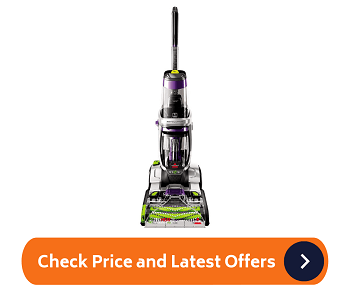 This is complemented by a DualV nozzle that ensures even suction throughout, providing even cleaning with each pass. To make cleaning faster, the Power Scrub Deluxe uses heated cleaning technology that pushes heated air through the carpet that not only makes cleaning more effective, but reduces drying time as well. The Power Scrub Deluxe uses dual tanks, with the clean tank also offering automatic detergent mixing to take the guesswork out of the process. Emptying the tanks takes a matter of seconds thanks to smartly-designed pour spouts. This one is best carpet and upholstery cleaner which also includes an 8-foot hose and upholstery tool with various attachments that can handle areas where the main unit can’t go. 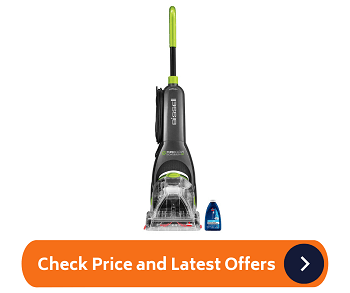 If you’re looking for a more affordable carpet cleaner that still offers a high amount of overall cleaning power, the Hoover Power Scrub Deluxe is a worthy choice. The Bissell SpotClean Pro has a pretty self-explanatory name, and it definitely backs it up with performance in every way. 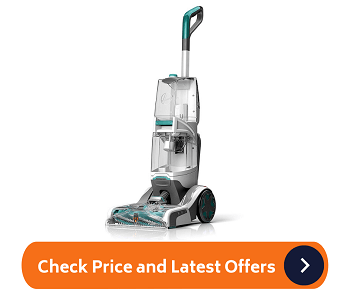 Although not a full-sized one with wheels, the Bissell SpotClean Pro offers a substantial amount of cleaning power in a portable package. The SpotClean Pro is best portable carpet cleaner which designed to be used for individual messes, rather than full carpet coverage. It is perfect for cleaning up the occasional spill or stain on carpet, using the same technology and engineering found with most of Bissell’s other carpet products. It combines scrubbing and suction action in order to remove dirt, debris, and stains. This cleaner is suited for isolated areas, but it is capable of tackling multiple areas in one sitting thanks to a large ¾ gallon tank. The cleaning head is 6 inches across, which is actually a decent amount of coverage with each sweep, cutting down on cleaning time. A 5-foot hose compliments a 22-foot power cord for plenty of reach from where you plug the unit in. In addition to the main cleaning head, the SpotClean Pro also includes a stair tool, and a stain remover tool that’s ideal for gunky messes that are too stubborn for the other attachments. These tools give the SpotClean Pro a lot of added versatility that makes it effective on everything from furniture to your car’s interior. The Rug Doctor Deep is an incredibly well-rounded one that’s perfect for home and office use, offering numerous cleaning capabilities with an easy-to-use design. 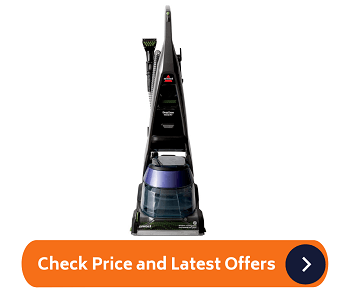 It has the look and feel of a professional carpet cleaner, with performance that’s not all that far off from one. The Rug Doctor’s cleaning ability is bolstered by an intricate rotating scrub brush that uses 10 rows of wavy brushes that loosen and remove even the toughest dirt and stains, which are then whisked away with best-in-class suction power that leaves nothing behind. The same is true regardless of what direction you’re pushing or pulling the unit. One of the most notable aspects of the Rug Doctor is how easy the maneuverability is. Rather than small wheels, this one uses large rear wheels that allow for easy steering and movement, even on thicker rugs and carpet. It also comes with a stair/upholstery tool that’s easy to use, and has a wide amount of coverage to make things a little less tedious. For the moments when you encounter a particularly tough stain or high traffic area, the Rug Doctor has a Super Boost button on the rear that sends out a blast of extra carpet cleaning solution with each pass, while spinning the brushes faster. When you’re done, the Rug Doctor’s upper portion folds down for easier storage, reducing its size by about half. As you can see, the Rug Doctor Deep is one of the only home use carpet cleaning machines that can hang on the same level as the many Bissell and Hoover products that otherwise dominate the market. This is a great with a very reasonable price. Full-sized cleaners are always a great thing to have, but one of the only real drawbacks to one is the size and mobility aspect. For the times when you need to clean up a single mess or stain, the Bissell PetStain Eraser Deluxe ION is the best product to have. 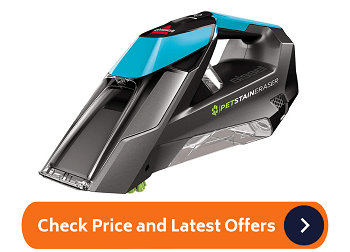 At first glance, the PetStain Eraser Deluxe ION looks like an ordinary handheld vacuum, and has a smaller profile that makes it easy to move around and clean with. Further examination reveals a front end that uses a combination of spraying cleaner, rotating scrub brushes, and powerful suction in order to quickly remove stains and clean a carpet or rug. The device is completely cordless, and operates off of a rechargeable lithium battery that offers an extended amount of cleaning time. The PetStain Eraser Deluxe ION’ dual-tank design keeps the clean water and dirty water separated, with the latter being easy to empty and dispose of in between cleans. The ION version also includes a wide squeegee that can convert the unit into a window cleaner, which is definhtely a nice and somewhat unexpected bonus. While the name of this product refers to pet stains, the addition of the squeegee and cordless aspect also makes this an excellent tool to clean your car’s interiors and windows with. The Hoover Power Scrub Elite treads the fine line between being a pet stain cleaner and ordinary cleaner, general use suited for the average home. It possesses several different cleaning modes and capabilities that make it one of the fastest and most versatile one on the market. 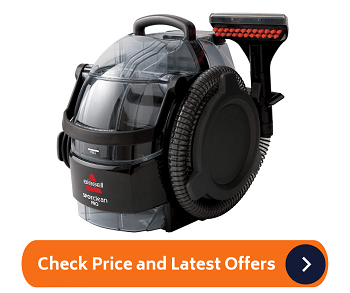 The Power Scrub Elite uses the standard Hoover design, which includes the V-shaped front end that ensures even suction. It combines this suction power with Power Scrub brushes to make quick work out of both stains and dirty carpets in general. Especially tough stains can be handled using the 2-in-1 antimicrobial pet tool attachment that has two separate inserts. The unit’s two large capacity tanks give you extended cleaning time without having to stop and refill or empty, as does the automatic detergent mixing feature. And since the cleaner is just around 19 lbs, you’ll have no trouble carrying it from room to room as needed. The main unit of the Power Scrub Elite has a deep clean mode that uses extra detergent and scrubbing power in order to remove tough stains. On the flip side, there’s also a Quick Clean Mode that uses extra heat to speed up the carpet’s drying process, which takes around 45 minutes in this instance. 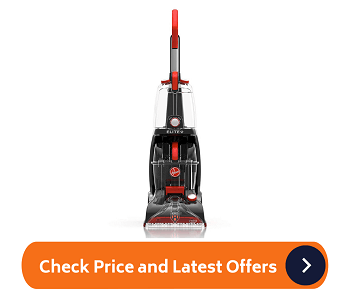 Overall, the Hoover Power Scrub Elite is an excellent value, and offers all the cleaning power and features needed to handle any mess. 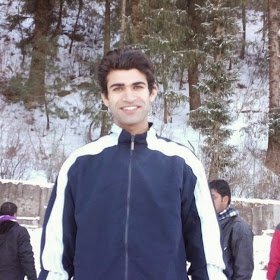 The Quick Clean Mode is fairly uncommon, and help to boost this cleaner into the top tier. Bissell’s ProHeat Revolution is a deluxe product that combines a ton of cleaning power with some smart and convenient features, making it one of the most complete carpet cleaning units you can buy, period. The main cleaning component of this unit is the dual DirtLifter Powerbrushes on the front end, which work in conjunction with Heatwave technology to provide a very thorough cleaning that will have your carpet or rug bag to brand new condition in just one or two passes. Bissell also addresses something that tends to be overlooked with machines like this: cleaning the brushes. Thanks to the EZ brush roll cover, you can quickly access the entire brush assembly in order to clean the brushes themselves, and remove any dirt, debris, or pet hair that’s been caught up in it. Now for some of the noteworthy features. The ProHeat Revolution has a CleanShot pretreater that can shoot a concentrated amount of detergent on a stain in your path, giving the cleaner some extra help when you are dealing with particularly stubborn stains. You also get a 2-in-1 pet upholstery tool that can vacuum up hair and debris in dry mode, or switch to wet mode and tackle stains and dirt. The Bissell ProHeat Revolution may be a little pricey in comparison to others, but the added cleaning power, access to the brushes for maintenance, and bonus features like the CleanShot and upholstery tool are more than worth the extra money. “Automatic” is a word that gets tossed around a lot, but Hoover isn’t messing around when it comes to the Smartwash Automatic. Practically every function of this product is automatic, which results in plenty of user-friendliness, and a very effective cleaning approach overall. The Smartwash Automatic has a sort of vacuum aesthetic, avoiding the overly bulky and awkward designs of many other cleaners. It using Auto Cleaning Technology that senses when you’re pushing forward and pulling back; when you push forward, cleans using brushes and suction, and when you pull back, it actually switches to a heat drying mode. The cleaner’s FlexForce PowerBrushes don’t miss a single spot, gently removing dirt and messes with each pass. HeatForce technology provides amplified heating ability that cuts down on dry time. A low profile front end allows for easy reaching under furniture, and in tough spots. Like every good carpet cleaner, the Smartwash Automatic also comes with a pet tool attachment that lets you clean on stairs, upholstery, and furniture with ease, and a removable front nozzle offers quick access to the brush assembly for periodic cleaning and maintenance. 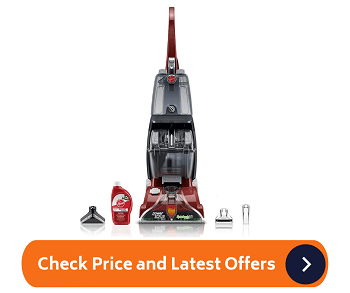 The Hoover Smartwash Automatic is a well-designed product that succeeds in making carpet cleaning easy and accessible to anyone, and is equally capable of cleaning serious pet and kid stains as it is general cleaning. The Bissell Turboclean Powerbrush Pet is basically an in-between carpet cleaner that’s not exactly a spot cleaner, but not really a full-sized general usage cleaner either. While this does sound limiting, the design mostly works in its favor. The Turboclean Powerbrush Pet is operated just like any other traditional cleaners, using a dual-tank system to spray cleaner on the carpet, with the other tank holding the dirty water as dirt and stains are suctioned away. Four rows of rotating DirtLifter Powerbrushes work extra hard to lift and remove stains and messes with each pass. While the Turboclean Powerbrush Pet does not have the same front end width of larger models, it’s still suitable for cleaning entire rooms and areas of your home, while excelling on rugs and isolated areas. The entire unit weighs just 12 lbs, so you’ll have no trouble carrying it to and from messes as needed. EdgeSweep bristles make sure to catch debris along floorboards and walls, and a removable nozzle in the front lets you clean the brushes periodically. When you’re done using the Turboclean Powerbrush Pet, the handle collapses down for easier storage in a closet. Keeping a cleaner for your home carpet on hand in your home gives you the ability to clean messes and stains in a matter of minutes, rather than more ineffective methods that are not only tedious, but generally fail to fully address the stains. While carpet cleaning services and carpet cleaner rentals have long been popular methods for keeping the carpets in your home clean, they are far more expensive, and don’t offer the convenience that having your own carpet cleaning machine around offers. If you have small children or pets, owning a product like that is essential to a having a clean home. The size of the cleaner often indicates what it’s best for. If you have a large home with lots of carpet and rugs, you’ll want a larger cleaner with a wide cleaning area, as this will cut down on cleaning time. If you live in smaller home, or have mostly hard floors, smaller units are often sufficient. They can often do more than just scrub and suction your carpet. Many models have extensions that allow for cleaning smaller areas like stairs, or furniture and upholstery. These attachments can also be used in your car. Other cleaning functions include heat, vacuuming, and separate scrubbing attachments for tougher stains. Additional features can not only add convenience, but improve overall cleaning ability. This can includes features such as auto detergent mixing, spot stain sprayers, water temperature regulators, easy tank emptying, and hose attachments with their own separate water tanks.